A Blog Of Ice Cream: Ice Cream - To Freeze Or Not To Freeze - ? Think of ice cream and most people imagine a frozen food ... but you would be wrong, well partly wrong. Why? Homemade ice cream is at its best when freshly made. Having made lots of ice cream at home, tested and tasted it freshly batched and having also eaten it after it's been stored for a few days in the freezer, I can tell you there is simply no comparison - both in taste and texture. Gelato, the popular 'artisan' ice cream originating in Italy, is acknowledged to be enjoyed at its best on the day it is made, not after it's been frozen. Although gelato means frozen, it's a little ironic that gelato ice cream is known more for being a 'soft' ice cream. In most gelateria (ice cream parlors specializing in gelato), making gelato is done that day actually on the premises and although it's usually served from an ice cream freezer, it is a different kind of freezer to what you normally see for American style ice cream. It's a "forced air freezer" which prevents the gelato from becoming too frozen. 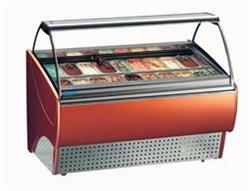 There are lots of ice cream display freezers on the market today for commercial ice cream sales. Some are large with numerous ice cream pans and others can be split-level ice cream display units. There are also some small countertop ice cream display freezers as well as upright display freezers. Whether you enjoy making your own ice cream recipes or going out to an ice cream parlor, it's worth remembering that freshly made ice cream will always be the best. Ice cream freezers are great for minimal storage of ice cream such as in gelataria but if you make your own ice cream you should be aware of the do's and don'ts of storing ice cream properly.